CAT Syllabus has remained more or less the same for the last decade but the paper pattern has changed. Before we actually try to understand the complete and detailed CAT syllabus for the CAT 2019 exam, we need to understand the pattern of the paper. Once we know the pattern of the paper, it would be simpler for us to understand the syllabus for CAT. The pattern for CAT exam has remained more or less the same for the past 3 years – CAT 2016, CAT 2017, and CAT 2018. It is safe to assume that a similar, if not exactly the same, pattern would continue for CAT 2019 as well. CAT 2019 exam would be divided in to three separate sections of 1 hour each. Another thing to keep in mind is the fact that you are not allowed to switch between sections. The order of the sections has remained the same for the past few years so the same is expected to continue. 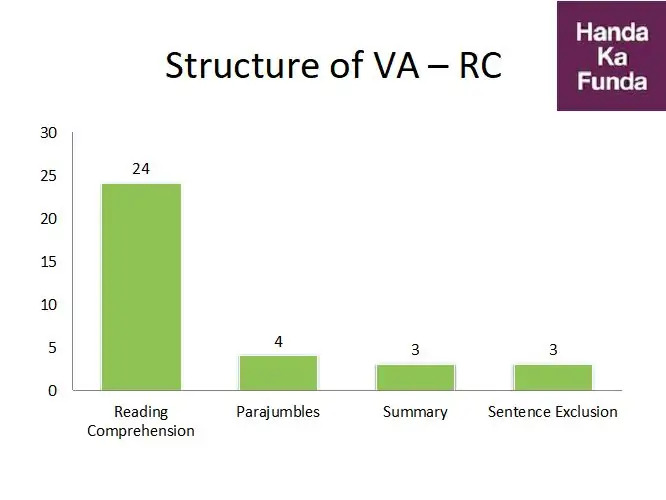 Over the past few years, the Verbal Ability and Reading Comprehension (VARC) section has focused quite heavily on Reading Comprehension. Out of 34, you can expect anywhere from 20 to 25 questions from the Reading Comprehension. The other 10-15 questions would be from the Verbal Ability part. I would like to add that it is unlikely that you would get questions on most of these topics but these are the tools that you would need to prepare and score well in the Verbal Ability and Reading Comprehension section. Logical Reasoning and Data Interpretation (LRDI) has become the most grueling of all sections in the CAT exam over the years. Typically, there are 8 sets with 4 questions each. To score around 90%ile need to do 2-3 sets correctly, whereas to score around 95%ile in the LRDI section, you need to do 3-4 sets correctly. I would like to divide the CAT Syllabus for the LRDI section in two levels. Level 1 consists of topics that you need to do to build a base. Level 2 consists of topics on which you can expect actual questions to be asked in the exam. The numbers given in the picture are based on the average pattern of the CAT exam over the last 4-5 years. You can expect a swing of +/- 2 questions in each category. Also, it is sometimes difficult to categorize a question in one sub-topic versus the other, so I have taken some poetic license while doing that. A common issue while preparing with Number System for CAT is that students are not aware or relative importance of various topics that are asked in Number System. They spend time sharpening their skills to find out the last two digits, or to understand Fermat Theorem to find out the remainders in Number System questions. These types of concepts are not required for CAT Preparation. It is one of the low priority areas of CAT syllabus. As far as CAT syllabus for Arithmetic is concerned, I would like to suggest that you divide it in three parts. Algebra is probably the most neglected portion of Quantitative Aptitude in CAT syllabus for the simple reason that people do not know what to do in it and where to practice for it. Some students think that they can skip topics like Basic Algebraic Equations and Inequalities because you rarely get direct questions on those in CAT. While it is technically correct, it is still a bad idea to skip these chapters. The reason being that the other questions that are asked in the CAT exam are based on these concepts. Given below are some of the topics that you can and should go through to get a good grasp on the Algebra section. If you have to look at the most important chapter in Quantitative Aptitude, it has to be Functions. Do not ignore that. 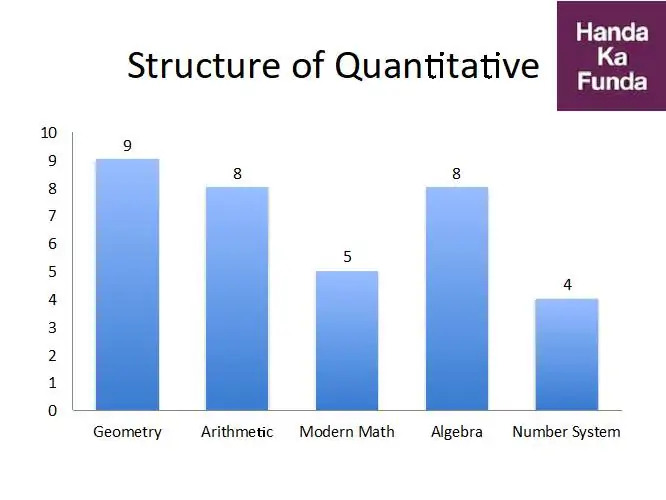 Over the years, Geometry has proven to be the most scoring (most scary for some students) part of the Quantitative Aptitude section. It is the only topic where you can hope for a direct application of a concept or formula without thinking too much about it. Often, you can just draw a diagram or even assume a value to get to the answer fairly quickly. The problem with Geometry portion of CAT syllabus is that quite a lot of students have not studied Geometry at all after class 10th. Even if it was a part of the syllabus, they focused on fancy topics lie Permutation and Combination or Probability. It would take some time to get back in to the groove but every hour that you spend on preparing for Geometry will help you in the CAT exam. Among the above topics, Co-ordinate Geometry and Trigonometry are low priority areas. If you can spend even an hour on Trigonometry to understand the basic concepts and simple applications of those basic concepts – it should be enough for the CAT exam. You do not need anything more than that. Similarly, as far as Co-ordinate Geometry is concerned – it is a combination of a large number of formulas. If you are good at remembering stuff, 75% of your co-ordinate geometry problems would be solved in less than a minute. Modern Math is a low priority topic as far as the CAT exam is concerned. It also includes some part that isn't really covered till class 10th Math such as Permutation and Combination, Probability, etc. However, those topics are not that important. What is important is topics like Set Theory. Questions on Set Theory can also be asked in the Logical Reasoning section so it is important that you are well prepared for it.